The 9x18mm Makarov cartridge is ballistically equivalent to a full-size 38 Special revolver. 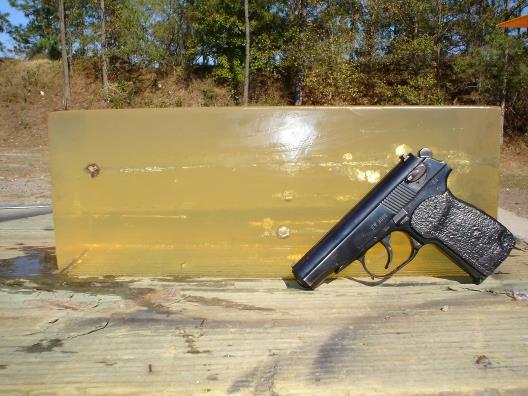 Since it is most commonly found in the Makarov pistol, though there are many other pistols and submachineguns also chambered for the 9x18mm Makarov, discussion will be constrained to the East German Makarov. Writing a review of any product requires taking a neutral position and avoiding bias as you evaluate the positives and the negatives of a product. I have a difficult time finding fault with the East German Makarov. It is well-built, reasonably priced, reliable and accurate. The trigger on the few models that I have shot is good on the single action and a bit heavy on the double action. Let me say up front that I prefer pistols with a little creep and then a light single action trigger pull like Glocks and 1911s that have what people would ordinarily consider to be ‘bad’ triggers for a 1911. Double action has never been my preference though there are many good reasons to try a DA-only firearm. Concealable handguns are lightweight, thin and short in terms of length and width. How big you are and how you dress determines what guns you can conceal. Pistols are carried on your belt. If you must, then try a pocket holster with a gun like a Kel-Tec P3AT. The fastest draw and the largest concealable guns come from belt holsters. Without getting into generalities about body shape and violating the above-presented rule, I posit that the Makarov is a firearm that any adult can successfully carry concealed in a belt holster. It is small enough and light enough to work for this role. It is cheap enough for most people to buy and the ammunition is cheap enough to PRACTICE REGULARLY with. Terminal ballistics are strongly dependent on the type of ammunition used. The cartridge is powerful enough to where you can use expanding bullets and still get deep penetration. I don’t recommend FMJ bullets for self-defense in this caliber. A JHP should expand and then penetrate to at least 12.0” in 10% ballistic gelatin in order to make it in any firearm that I carry for self-defense. Most fights, in the concealed carry context, are over when your gun makes its appearance. Even slimmer odds hover around the ‘bad guy’ wanting to stand around and fight. Assuming the worst case, you need to make sure that you take the time to hit with the first shot—this will dictate your marksmanship through to the end of the fight. With a 40% hit probability being reasonable to assume, the handgun with a 9 cartridge capacity (Makarov) will deliver 3.6 hits to the target. If you are able to fire 9 times then 3 bullets will hit the target at ranges less than 12 meters.